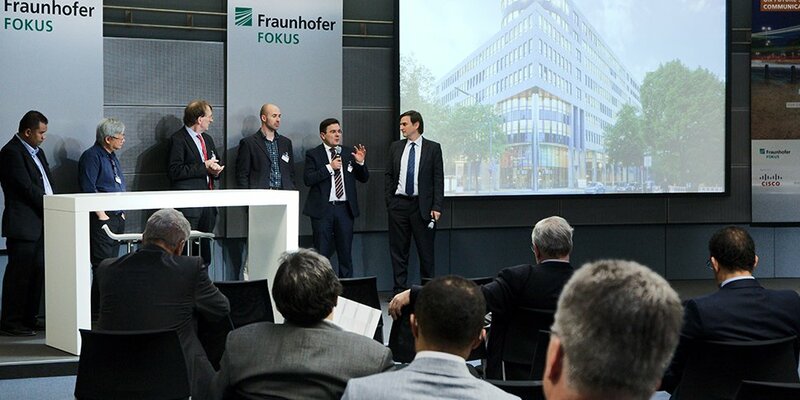 The FOKUS FUSECO FORUM (FFF) 2015 was the sixth event in the series and attracted approximately 200 telecommunication industry experts and academics from 32 countries. FFF 2015 provided a unique discussion platform for representatives from international network operators, standard development bodies, and leading academic organizations. 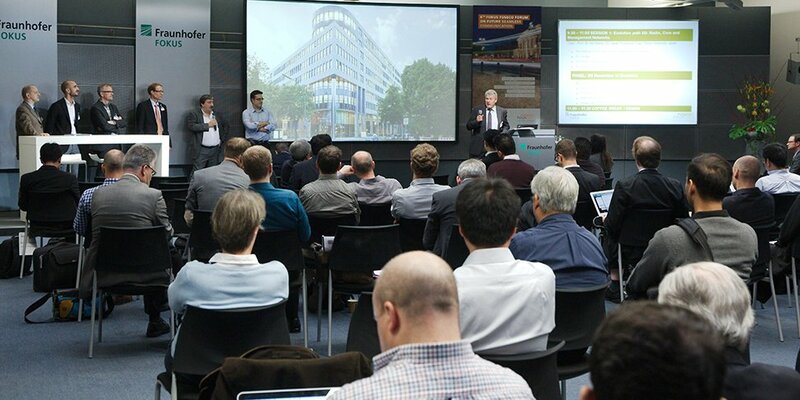 This year’s event theme was “Digital Convergence and Seamless Connectivity for everyone and everything – Bringing 5G, SDN/NFV and M2M/IoT together” focusing on the evolution of service control platforms for fixed and mobile next generation networks and their impact on industry. FFF 2015 offered two full days of technical tutorials, interactive workshops, conferences, exhibition booths, and live demonstrations. Day one started with two parallel tutorials followed up by three simultaneous workshop tracks. The tutorial “Network Evolution towards the 5G Environment” provided an overview of use cases and technology covering the main elements of the future 5G technologies: Radio, core, management, Network Function Virtualization (NFV) and Software Defined Networks (SDN). The second tutorial provided a detailed perspective on Internet of Things (IoT) and Machine-to-Machine (M2M) Data Processing and Cyber-Physical Systems required for the Industrie 4.0, Industrial Internet and Smart Cities. Two interactive sessions and a subsequent panel were presented in this workshop. The first session “Radio and Core Network”, chaired by Prof. Dr. Aki Nakao from the Tokyo University, discussed new concepts for the evolution of Radio and Core Network elements towards 5G. The session was opened by Luis Miguel Contreras Murillo, from Telefonica, presenting 5G Backhauling, emphasizing the requirements and use cases of 5G networks and motivating the need for a “Mobile Backhaul” where “SDN control” will play a fundamental role in the orchestration of network resources. This topic was further explored by Prof. Kuklinksi from Orange Poland in his presentation “Generalized Orchestration”. According to him, the “Zoo of Orchestration” creates a considerable problem in the NFV ecosystem since currently available solutions offer little interoperability among each other. He presented some definitions of what Orchestration is in the NFV domain and compared those definitions with what Orchestration means in other domains. Jonathan Hart from BT presented 5G network architecture concepts that drive the 5G evolution while Hans Einsiedler, Deutsche Telekom, presented how novel system concepts for control planes allow serving the diverging needs of different verticals. Prof. Raymond Knopp, from EURESCOM, presented results from the softwarization of RAN components and how Open-Source cloud software is impacting the cloudification of the RAN. From his perspective “RAN should be more tightly integrated in cloud computing frameworks”. The first session was closed by Adam MacHale from Cisco. Mr. MacHale talked about service and application diversity in the upcoming years and the importance of 5G platforms for supporting their requirements. The second session, chaired by Antonio Manzalini from Telecom Italia, started with a presentation by Martin Herbst from Multikom about Opossum an “OpenFlow-based communication system for multi-energy domains”. Eiji Kawai from the Network Testbed R&D Laboratory of NICT presented the IoT Testbed in JGN. The “RISE” testbed is one of the largest SDN/OpenFlow testbeds in Japan currently integrating with “JOSE” providing facilities to verify and evaluate new smart ICT service technologies. Alexandra Mikityuk from T-LABS talked about “Cloud Browser RTEs and APIs”. She presented the benefits of moving network functionalities into the cloud providing the possibility to address also legacy and low-end devices. Lauri Isotalo from Elisa presented “Telco business in the era of SDN and NFV” emphasizing that “new types of ecosystems emerge with multiple complementing vendors working closely to guarantee end-to-end service quality”. Prof. Dr. Thomas Bohnert from the Zurich University of Applied Sciences presented results from the Mobile Cloud Networking project. Several Open Source frameworks for NFV prototyping have been presented: Hurtle (for orchestration) and Cyclops (for rating, charging and billing) are just two of the tools provided to the community for building an end-to-end network “as a service”. Their usage was presented by the next speaker, Simone Ruffino from Telecom Italia, who showed how those different tools were used together with the OpenEPC platform provided by Fraunhofer FOKUS for building an end-to-end virtualized mobile core network. Robert Mullins from TSSG presented work from the European project CogNet that applies Machine Learning and Data Analytics to Network Management. The session was terminated by a talk by Werner Eriksen from Telenor Digital presenting their innovative “recipe” for building a public cloud based virtualized software telco. The workshop ended with a panel session moderated by Prof. Dr. Thomas Bohnert where all the speakers participated. Discussions topics ranged from technical to social issues. Due to network softwarization there will be a complete change in required skills. Most of the telco operators in the panel indicated that there is a new need for hiring people able to program their network. With respect to virtualization and clouds the role of the Service Delivery Platforms (SDPs) in the upcoming years was addressed. For the operators the infrastructure is becoming a commodity, and OTT is pressing with very low time to market. Therefore, telcos have to find more business-oriented services for monetizing their platforms in the upcoming years. On the other hand telcos are affected by regulations, and most of the time they cannot even make use of a lot of “big data” that is produced in their infrastructures. Indeed, all the data collected from their infrastructures could improve the way services are provided to customers. Operators in the panel stated that in the upcoming years SDN will be the main software development for them and that they will start their own software companies for building software network infrastructures. The second workshop was chaired by Dr. Florian Schreiner from Fraunhofer FOKUS and comprised of two interactive sessions and a subsequent panel discussion. The first session covered “Information and Communication Technologies for Industrie 4.0/Industrial Internet and Factories of the Future”. Dr. Bernd Heinrichs, Managing Director of the CISCO Innovation Center “openBerlin” explained how a combined fog/cloud architecture serves industrial real-time, security, resiliency and data explosion issues, and how the first Innovation Center of Cisco in Germany will help to deliver a platform for advanced development of Industrie 4.0 compliant solutions for the German market. Stephen Mellor, CTO of the Industrial Internet Consortium (IIC), introduced the IIC, its vision, working groups and the Industrial Internet Reference Architecture (IIRA). 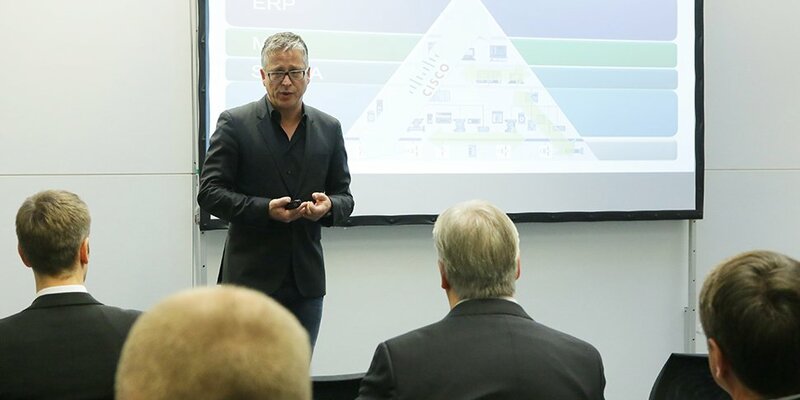 Bodo Körber, Managing Director at Accenture Digital, presented the findings from the World Economic Forum Report explaining the potential and status of adoption of Industrial Internet of Things technologies. The session concluded with a presentation by Wolfgang Dorst, Division Manager Industrie 4.0, BITKOM, Germany, introducing the Industrie 4.0 vision and providing recipes for digital business models in the era of the fourth industrial revolution. The second session “ICT enablers for Industrie 4.0/Factories of the Future” covered architectural approaches, best practices and approaches where different ICT solutions serve as enablers for future industrial use cases. Edwin Sutedjo, Head of Service Innovation at Nokia Networks, Technology & Innovation, Germany, presented an architectural vision of industrial ICT infrastructures, which, by serving different performance requirements, will be boosting new business models and processes. Dr. Lutz Rauchhaupt, Deputy Head of the ICT and Automation Department at ifak e.V., Germany, presented requirements for integrating wireless communication systems for advanced manufacturing/Industrie 4.0. Eckhard Hohwieler, Head of Department Production Machines and Systems Management, Fraunhofer IPK, Germany, presented different approaches related to application monitoring and control in Industrie 4.0 environments, including intelligent self-organized shop-floor production and industrial cloud-based control platform production with Cyber-Physical Systems. Prof. Dr.-Ing. Christian Wietfeld, TU Dortmund, Germany, introduced the vision of the BERCOM project that will provide a blueprint for Pan-European resilient critical infrastructures based on evolved LTE communications. Stefan Vaillant, Cumulocity GmbH, Germany, introduced the „Cloud Fieldbus“ as a solution for connecting the industry with the Internet. The concluding panel discussion discussed R&D priorities to be set for realizing the Industrial Internet, the position of Germany’s Industrie 4.0 initiative in the global Industrial Internet context as well as technical and political road-blocks for the Industrial Internet evolution. The third workshop covered two interactive sessions led by Dr. Adel Al-Hezmi from Fraunhofer FOKUS. The first session, titled “The M2M and IoT Platforms as Key Enablers for Smart Solutions and Applications” focused on business and technical aspects in the area of M2M and IoT technologies from different perspectives. Philippe Houtteman from Ooredoo Group chaired the session and gave an overview about M2M challenges and Ooredoo approaches and targeted vertical domains, especially in the smart city context in Qatar. Dr. Wolfgang Granzow from Qualcomm gave an overview to the oneM2M specification and the future outlook for release 2.0. Daniel Godde from Ericsson GmbH highlighted security aspects in IoT and proposed solutions. The last presentation was provided by Alexander Berlin who presented the status of the FIWARE accelerator program supporting new start-ups that apply FIWARE technologies. The second session, “Innovative M2M/IoT Solutions and Applications”, included several talks focusing on various success stories and the way operators and M2M vendors approach IoT markets. Luis Sanchez, University of Cantabria, presented SmartSantander, an open smart city infrastructure that has been developed within several projects and provides the collected data to external users. Emil Berthelsen from Machina Research introduced “Enterprise IoT as a global trend in IoT and M2M”. IoT/M2M platform capabilities should cover business analytic functionality and support or integrate within the enterprise business service platform with an emphasis in real-time integration. Roberto Minerva from Telecom Italia suggested that operators will react disruptively and move towards a software-oriented company based on 5G in order to become more effective, specifically in the IoT/M2M market. In order to overcome the huge complexity of the billions of interconnected objects and the “network of networks” it will be necessary to understand the role of intelligent terminals and devices as intelligence will be located at the edge of the network, and 5G will be a key enabler. Gus Desbarats, Alloy Chairman, gave a perspective on designing IoT solutions by focusing on the usability of the service for the end user. 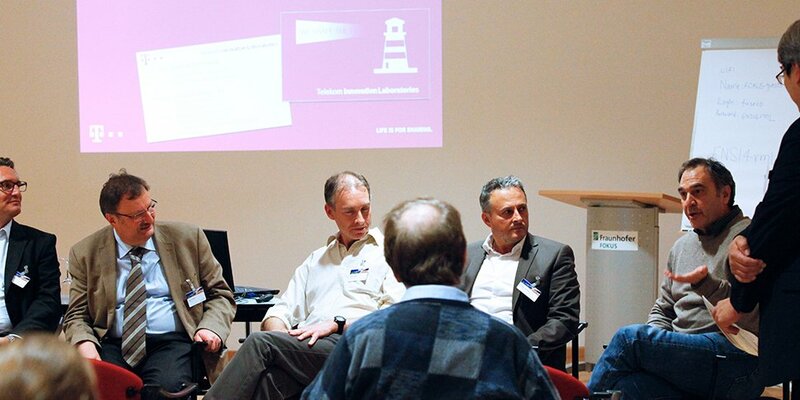 Joachim Schonowski, Senior Innovation and Project Manager at T-Labs, Deutsche Telekom AG, presented the project “reTHINK” as a disruptive approach for communication infrastructure based on context-based communication and various Smart City services. The panel session was chaired by Emil Berthelsen from Machina Research. He started with a brief introduction to the importance and evolution of M2M/IoT platforms and their associated ecosystems. The panelists discussed the role of the operators in the M2M/IoT market and their main contributions and added value (in addition to the provided connectivity) across their regional and global service offers. The panelists agreed on the importance of privacy and security indicating that these are the top challenges for rolling out the M2M/IoT solutions. However, Gus Desbarats argued that the privacy is a non-technical challenge comparing it with security. Finally, the panelists agreed that the M2M/IoT requires collaboration with all stakeholders involved in the value chain of the M2M/IoT solutions. The second day united the different tracks of the previous day under the main theme of this year´s FFF by a full day conference, titled "5G starts now – Putting the building blocks for 5G together", which consisted of four sessions. Each session was preceded by presentations from various international network operators, vendors, academics and standardization bodies, concluding with a panel. The first session was chaired by Prof. Dr. Aki Nakao, 5G Japan Promotion Chair, from the Tokyo University in Japan. He opened the session with a presentation on network softwarization and provided a status report on the activities of the IMT-2020 Focus Group under ITU-T SG13. Prof. Nakao highlighted 3 main results from the aap analysis: Network slicing for 5G, emerging network architectures making a reference to Information Centric Networking (ICN) and Deep Data Plane Programmability for data plane enhancement. The next presenter was Dr. Fumio Watanabe. His presentation centered on challenges for 5G technologies. 5G will require novel radio access technologies with very high performance. New network architectures are needed for full utilization of 10Gbps radio access in small spots, mentioning ICN-based architectures as an example. He emphasized the importance for the 5G architecture to be “extremely flexible” and to be able to support several logical networks with different characteristics (network slicing). Mr. Hans Einsiedler from T-Labs, Deutsche Telekom, and active in the 5GPPP initiative presented on the 5G strategy and priorities in Europe. He emphasized that 5G is not just another next generation mobile technology, but represents a new paradigm leading to fixed mobile convergence. Mr. Franz Seiser presented 5G activities at Deutsche Telekom. Deutsche Telekom is already in the transformation process of becoming a “software defined operator”, in line with the latest technical advances on SDN and NFV. Deutsche Telekom needs to develop in mainly three directions: Business agility, efficiency & sustainability and network capabilities. Mr. Seiser emphasized that 5G is not “only” another new radio interface, but rather an evolution on the network access side. 5G will introduce a new network core to support the requirements and functionalities envisioned. After explaining the NGMN architecture proposal for 5G, Mr. Seiser presented activities at Deutsche Telekom towards 5G concluding with a high level development plan. The last presenter was Dr. Walter Haeffner from Vodafone, Germany, who presented Vodafone’s vision of 5G. Dr. Haeffner´s presentation focused on the business potential of ultra-low latency 5G networks and a hierarchy of edge clouds supporting different 5G services. 5G is about the steering and control of networks. A key business opportunity comes with the Internet of Everything, presenting use cases including the control of a swarm of mobile robots, self-driving cars, remote-controlled robotic surgery or the steering of smart power grids. Dr. Haeffner concluded his presentation highlighting the importance of “Cloudlets”, computing and processing capabilities at the edge of the network, close to the controlled and steered devices. Mr. Jonathan Hart from British Telecom joined the presenters for the concluding panel. With respect to the investment in 5G the panelists agreed that it is important to identify best ways to monetize the technology and that investments in 5G should be targeted on enhancing the end user experience. The panel indicated that this can only be achieved by the convergence of the different access methodologies. Openness will be one of the most important characteristics of the upcoming technology as long as it enables easy connectivity to APIs and innovative services. The second session chaired by Prof. Paul Kühn, University of Stuttgart was devoted to impacts of SDN and NFV on the telecom industry. Antonio Manzalini from Telecom Italia gave an overview on softwarization trends and identified challenges and opportunities for telco operators. Telcoms need to develop a unified perspective for a Global OS capable of executing 'X-as-a-Service'. Bruno Chatras, Orange, reported on 'Moving NFV beyond trials'. He sees the need for progress in standardization towards multi-vendor interoperability and further automation of the life cycle management of all components including NFVI and MANO, but he is confident that most items will be addressed in the ETSI ISG NFV 2016 work program. Luis Miguel Contreras Murillo, Telefonica, discussed operational, organizational and business impacts from SDN and NFV for network operators. Some of these issues have been taken up in the H2020 5GEx project which has the goal to respond to challenges arising from SDN and NFV. Dr. Rolf Schuster from Vodafone Group presented the Open Edge Computing initiative building on OpenStack-based Cloudlets. Open Edge Computing enables a new category of services and customer experience, and offers attractive benefits and business opportunities to all players in the value chain. For this to happen, however, requires further joint and coordinated actions. The presenters where joined by Christian Schaefer from 7 Principles, Germany, and Alberto Diez from Core Network Dynamics, Germany. The panel agreed that standardization is one of the key challenges that needs to be addressed, especially with respect to the interoperability and network management. According to the experts the main purpose of standardization is to avoid proprietary solutions and enhance interoperability. The panel also indicated that important organizational changes and impacts need to be evaluated. The third session was chaired by Sebastien Ziegler, President of the IoT Forum, Switzerland. The first presentation “5G and IoT” by Dr. Henning Schulzrinne from Columbia University addressed the fact that since there are not enough one millisecond applications, it is unlikely that IoT drives the 5G initial demand by itself. IoT applications will be mostly low-bandwidth, low-cost apps. Key challenges for IoT are discovery enablement and access control. 5G should use the opportunity to simplify the network rather than adding more functionalities. Mr. Ben Younes Khaled from OOREDOO in Qatar outlined the transformation to digital business strategies and technological choices. He presented processes and steps for the introduction of Industrial Internet. The third presentation “Smart City Initiative in Indonesia” was held by Dr. Andri Qiantori from Telkomunikasi Indonesia. Dr. Andri presented an analysis and evaluation of the “smartness” of the main cities in Indonesia. Based on the "Telkom Smart City Framework" the city wants to upgrade to the highest maturity levels. The framework consists of three main pillars: 1) ICT infrastructure to ensure true broadband infrastructure and experience by 2002, 2) Integrated City Management Bringing City to Integrative Level, 3) Smart User, by educating citizens and involve modern generations to be part of the digital ecosystem. The last presentation was provided by Hugo Van Zyl from Telkom South Africa, entitled “The Smart Emerging Economy, empowered through techlaboration”. Mr. Van Zyl pointed out that currently the emerging markets are falling behind the IoT hype. The business cases with ubiquitous 4G and 5G (especially in sparsely populated areas) are challenging. IoT use cases have a great impact in rural areas; however, it is necessary to have lower technology barriers to enter in order to succeed. Roberto Minerva from Telekom Italia joined the presenters at the panel. The panelists agreed that IoT enables the Internet of People and that entrepreneurs will benefit from it, indicating that “one size will not fit everyone.” Therefore, operators should work with service providers to be able to deliver the service to the end user. IoT might be deployed without human presence, but it will require coverage. Therefore, coverage will become critical. Finally, the priorities to ensure the global adoption of IoT were discussed. The panelists agreed that usability of the IoT technology for the end user, network simplification and life cycle management for IoT products are essential. Security, openness to service providers, and the resolution of data ownership need also to be added to the list. The fourth session was chaired by Dr. Florian Schreiner from Fraunhofer FOKUS. The first presentation “Value Generation Options in Industrial Internet – An Operator Perspective“ was held by Ernst-Joachim Steffens from Deutsche Telekom (DT). He shared the vision of the DT regarding Industrie 4.0 as “Telekom puts the industry on the net”. Connecting the industry across several layers brings new challenges: Market, horizontal connectivity, and interoperability challenges. To overcome them the DT IoT platform must be able to manage the complexity of services, devices and interfaces with a short time-to-market. According to him, DT should also develop own services while reusing existing ones, assuring security and privacy according to German laws and using open standards to increase interoperability. The second presentation held by Dr. Stefan Bungart from CISCO was entitled “Industrial Internet Perspectives – Visions from a Global Player.“ Dr. Bungart indicated that the main barriers to overcome manufacturing are the lack of visibility of the supply chain, floor plant KPIs and the inability to access data within production. On the other hand he emphasized that analytics, automation, connectivity, and mobility are some of the key technology enablers. 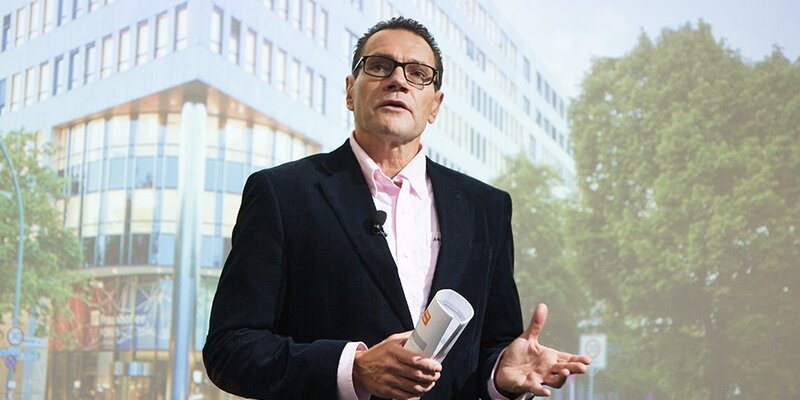 Dr. Bungart stressed that in some cases analytics will not be possible in the cloud (because of the latency) but in the machine itself, making the reference to “edge analytics.” Finally, he concluded that the digital manufacturing will not be a one-step transformation but a journey to acquire significant impact in the KPIs. 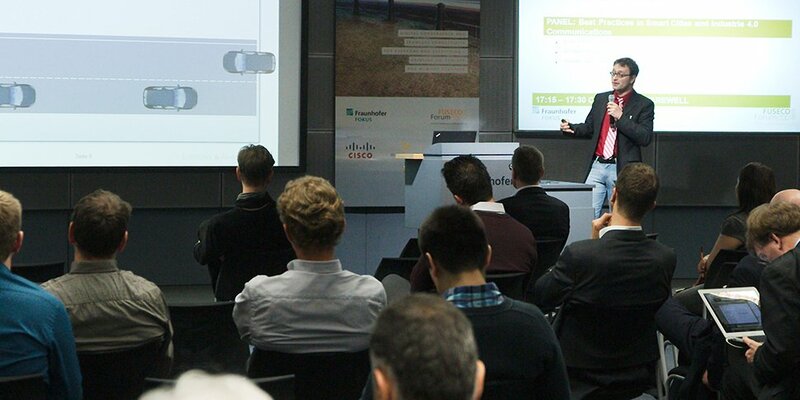 The last presentation “Automotive Requirements for Future Mobile Networks” was held by Andreas Kwoczek from Volkswagen. Mr. Kwoczek presented the complexity of the next use cases for Advanced Driver Assistant Systems (ADAS) such as Cooperative Maneuver Planning and Tele-Operated Driving. He remarked the importance of a reliable and ubiquitous connection (independent of the operator) to make the use cases possible. Additionally, he indicated that high data rates and low latencies, especially for cooperative automatic driving functions, will be required. 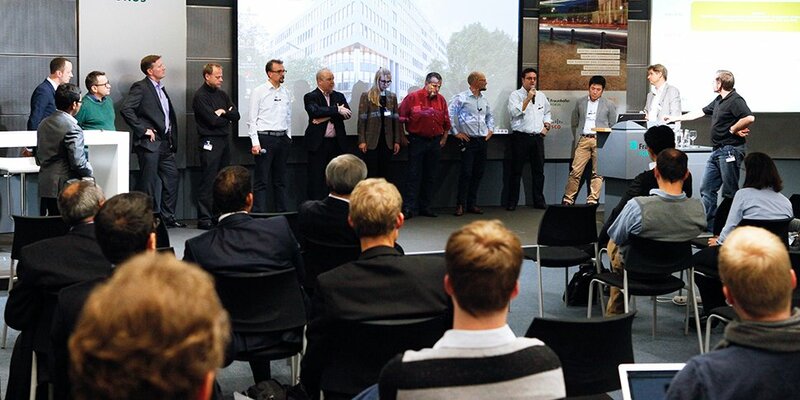 Finally, all the participants joined the panel “Best Practices in Smart Cities and Industrie 4.0 Communications.” During the panel the participants agreed on the importance of analytics, connectivity and low latency to enable digital manufacturing. “Enriching Information Space with Computer Vision Data Demo", which showed the benefits of combining Computer Vision with Cyber-Physical Systems. 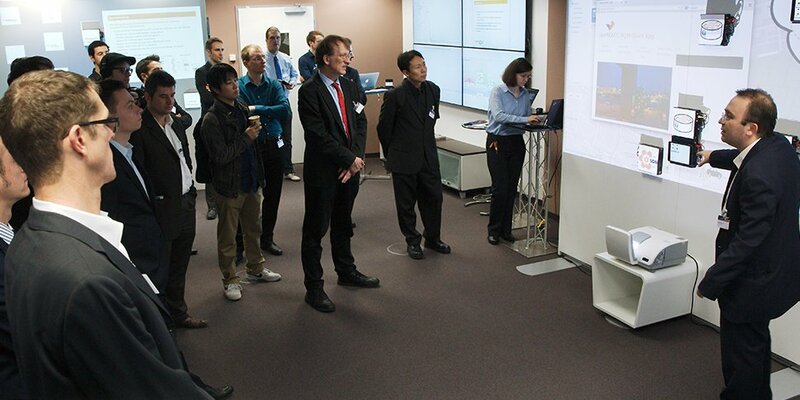 All demonstrations were based on the newest testbed toolkits from Fraunhofer FOKUS, namely Open5GCore, OpenSDNCore, Open5GMTC, OpenMTC, FUSECO Playground, as well as the new OpenBaton, an open source ETSI NFV MANO Orchestrator. 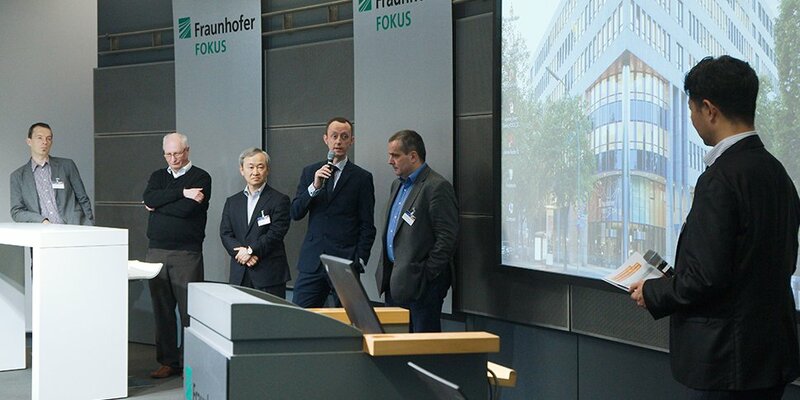 Based on the global relevance of the addressed topics and technologies, and following the continued success of the FOKUS FUSECO Forum series in the past, the 7th FUSECO Forum is planned for November 3 & 4, 2016 (tbc) in Berlin, Germany.